Devoted Quilter: A Finished Hands 2 Help Challenge Quilt! I finished my Hands 2 Help quilt, with a couple of days to spare before the linky party ends! The little ones I babysit were sick for a couple of days, which I would certainly never wish on them but it did give me a few extra hours of quilting time. 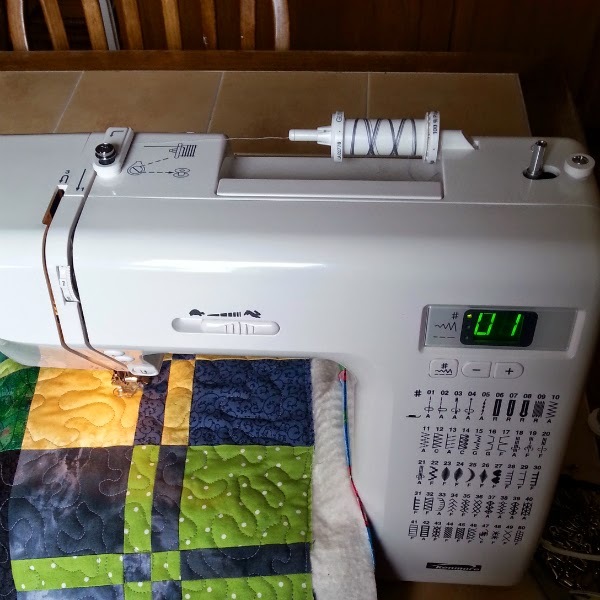 The quilt looks a little odd to me because the blocks are all around the edges and the middle is just a plain piece of fabric, but I think some little boy is going to love all those machines in the middle. I pieced the back from two flannels I had in my stash, neither of which was quite large enough on their own. More machines! My three boys all loved big machinery when they were younger. 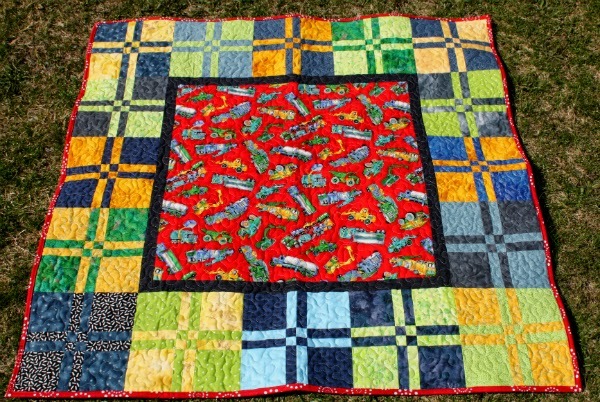 Hopefully this quilt will go to another child who gets excited about loaders, plows, fuel trucks and dump trucks. I quilted with a simple meander and had just enough thread to finish. Then I gave machine binding another go, and finished that with just enough thread as well! Phew! I'm pretty much a machine binding convert now. This one still isn't perfect, but it is neater than the placemats and my scrappy log cabin (which is finished but I haven't had a chance to get pictures yet). And it feels good to get that binding on so quickly. Hooray for faster finishes! This is my second finish for this quarter's Finish A Long. You can find my list here. 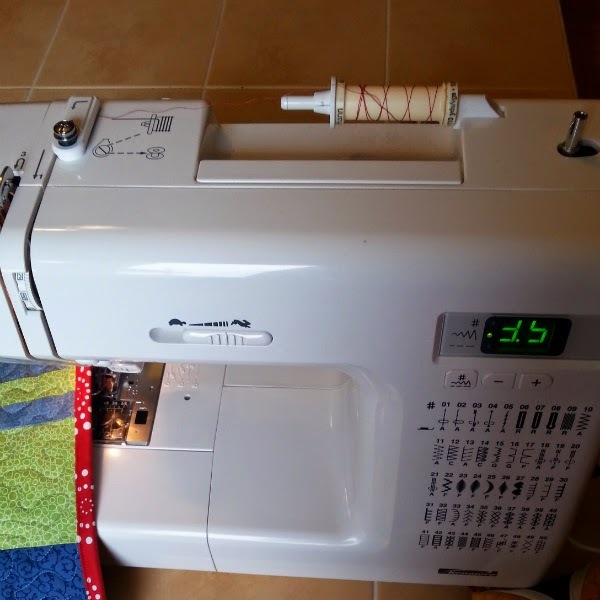 I'll be linking up with Sarah for the Hands 2 Help Big Reveal, NTT Thursday, I Quilt, TGIFF, Finish it up Friday and with Sarah again for Can I Get a Whoop Whoop. Craftsy's BIG Summer Sale: Save Up to 50% on ALL Online Classes! Want to learn a new skill or brush up on an old one? Now is your chance! You can save up to 50% off on ALL online classes at Craftsy's BIG Summer Sale! Cooking, cake decorating, sewing, gardening and so much more... all up to 50% off, with some classes starting at just $9.99! This is a sale not to be missed, so make sure you hurry because it ends at 11:59pm MT on Monday, June 9th. I love Craftsy classes! I've recently started poking around in the non-sewing classes (the cooking ones, mostly) and there are some amazing classes there too. I love the blocks around the edge. It will be great for playing and snuggling. That's a great quilt! And phew on the thread not running out TWICE! I love the backing - it makes me think of pi (3.14159....). I agree, someone is going to love this quilt. Lovely finish! This will definitely be much loved, machines and a snuggly backing - what more could a little boy ask for! This is a really neat finish and I do like that the blocks surround the center panel. Sure to be loved! Beautiful quilt! Love the colours and that you are giving it to a charity! Thanks for sharing on TGIFF! 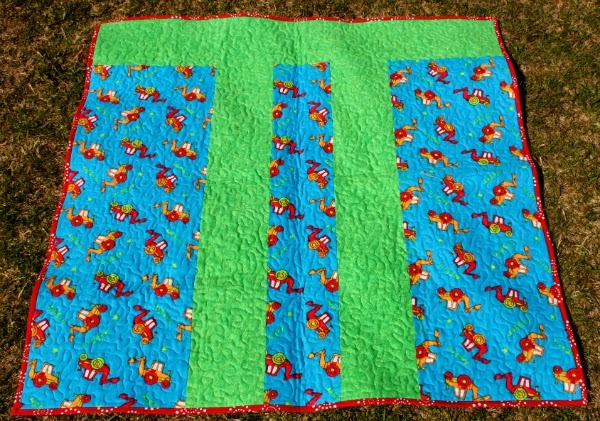 Great quilt for a little boy - you can't go wrong with tractors and diggers. Isn't it satisfying when the thread lasts out until the very end for you? I have started a new link up on my blog - Free Motion Mavericks. It would be lovely to see you there!